During the New Kingdom there was a great deal of trade with West Asia. Egyptian armies even conquered much of Israel and Syria, though they were constantly fighting the Hittites and Assyrians to keep control of it. The pharaohs built great temples all over Egypt. Egyptian queens were very powerful at this time. In 1490 BC one of them, Hatshepsut, became Pharaoh herself. 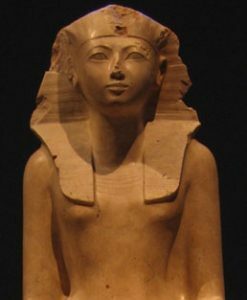 Hatshepsut’s reign was long and peaceful, and she built up many trading agreements with African kingdoms south of Egypt (often also ruled by women) that made Egypt much richer than before. In 1363 BC, a famous Pharaoh named Akhenaten built a new capital city for Egypt at Amarna. Akhenaten seems to have worshipped a new sun god, and developed new art styles, maybe more closely related to other African artwork. 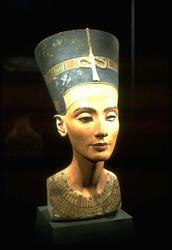 Akhenaten’s wife was Nefertiti. Akhenaten had a lot of little girls, but no sons, and his successor was his son-in-law Tutankhamon. 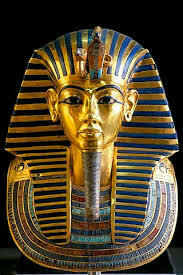 However, by 1333 BC the Pharaohs went back to the old religion. In 1303 BC a new northern dynasty or family of Pharaohs took over, the 19th Egyptian dynasty. Their first king, Rameses, moved the capital back to Memphis in the north. Priests became very powerful. Fighting with the Hittites in West Asia continued, but also a lot of trade. This is the time when the Bible says the Jews were slaves in Egypt. 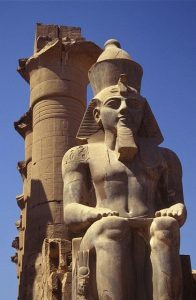 The 20th dynasty Pharaohs, around 1200 BC, continued the same policies. They were all called Rameses. These pharaohs fought off many attacks on Egypt, first from Libya to the west and then from West Asia, by a group that the Egyptians called the Sea Peoples. The Hittites were destroyed, though around 1100 BC the Egyptians fought off the Sea Peoples in a great naval battle. But the trouble in West Asia seems to have caused a general economic depression in the whole Eastern Mediterranean and West Asia. Soon afterwards the New Kingdom collapsed. Did you find out what you wanted to know about New Kingdom Egypt? Let us know in the comments! Rulers of Ancient Egypt, by Russell Roberts (1999). Includes chapters on Hatshepsut, Akhenaten, Tutankhamon, Rameses II, and (oddly) Cleopatra, who ruled much later. Easy reading. Chronicle of a Pharaoh: The Intimate Life of Amenhotep III, by Joann Fletcher (2000). 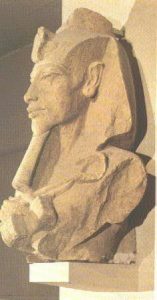 Amenhotep III was the father of Akhenaten. For high schoolers. Cite this page: Carr, K.E. When was the New Kingdom? Ancient Egypt. Quatr.us Study Guides, June 15, 2017. Web. April 21, 2019.